**Update #2** – My source of a source has informed the Blogle that Tulsa’s Todd Graham is the last interview that Auburn will hold before announcing Gill as the head coach in the next day or so…again, a source of source told me this and I’m just telling you. **Update** – Obviously 4pm has passed and no announcement. My source now tells me that his sources say that Auburn’s mind is made up, however they will continue hold interviews as a formality. Once the interviews are over, the announcement will be made. The reason it was given a 4pm time slot is that the source of the source assumed that interviews would be wrapped up by that time. **Note** – For all of you that are bashing and be hating on me, I clearly stated a disclaimer (seen just below) stating that this is all ‘source of a source’ stuff and that I myself would even disregard a sentence beginning the way I began the post. I was just posting what I had heard from someone who has seldom to never been wrong on insider Auburn news. I usually disregard any sentence that begins the way I’m about to begin this next one so take it for all it’s worth. I have a source who has sources INSIDE the Auburn Athletic Department that believe it to be a very good chance that Turner Gill will be announced as Auburn’s next Head Football Coach. The announcement is believed to occur around 4pm CST. Again, this is a source of a source, but in case it is true, I wanted to be the first. If this is true, I’m about 98% happy with the selection. Plus, with a name like Turner Gill, the transition should be easy. Tuberville –> Turner Gill…get it? It’s ten after four…where is the announcement? Oh well, I wish this had been true. If you read the post, I stated about 18 times that this was a ‘source of a source’ kind of thing. And I even said that I usually disregard these types of reports too. This was just given to me by someone who hasn’t been wrong too often when it comes to insider Auburn news. I’m not responsible for anyone taking it as fact. While the source’s source’s timing may have been off…I hope the outcome is the same whenever it happens. From the names I’ve seen floating around that are probable, it seems Gill is our best bet. I’ll believe it when the Birmingham News reports it. Rumors are crazy with a coaching change. Other Rumors I’ve heard: Spurrier was in Auburn yesterday, Pete Carroll was in Auburn looking at a house to buy, Leach, Fisher, Johnson, Hoke, Nix, Sullivan, Propst, McCracken, Dubose, Bill Curry, Monica Lewinsky, Ronald McDonald. Also, let me say this….. It wouldn’t suprise me one bit if they hired Gill… BUT it also wouldn’t suprise me if they didn’t. They could be just throwing the rumor out there so that they won’t take heat about not giving a black coach a legitimate opportunity…. blah blah blah…. Gill could be hired, or this could all just be smoke and mirrors. Do you STILL think it’s going to happen? What % chance? Turner Gill is my #1 choice. 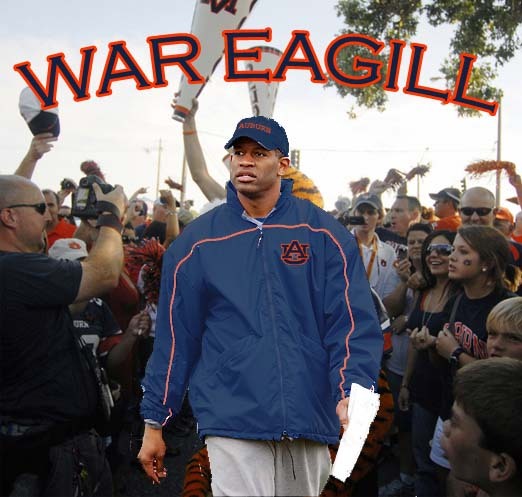 Auburn would be dumb not to give him an offer! I am 65% sure Turner is their choice, the other 35% is that they have a huge name that we haven’t even heard of that they are working on. Again, this is just stuff that I have heard. Do you think this will happen by Friday? I really don’t think so. As much as I think Gill would somewhat work, after I sit back and think about who we’ve interview, I’m embarrassed. We can not say that the Buffalo head coach is our BEST choice out of every coach, especially if money is not an issue. So I say that to say that I hope it’s not done by Friday because it will mean that we are talking to someone bigger and better. I’ve looked at all the candidates. If we don’t hire a Bill Cowher or Chris Peterson, Turner Gill is the BEST fit at Auburn and I would be darned PROUD to have him. I agree, I really like Gill too, but what would you think about Pat Nix as OC? I love Pat Nix as an Auburn man, but his past two offenses, Ga. Tech and Miami, haven’t exactly been stellar. I think this working out perfectly to have Auburn hire a huge name out of the blue that we haven’t heard of at all in the coaching search rumors.